At the site of a former cocoa factory in Canada's Quebec province, tiny holes punctured in the walls of a warehouse allow fresh air to cool thousands of whirring processors connected by a tangle of wires. Yessoulou Coulibaly watches over the sea of 7,000-odd computers hidden away in this industrial park at a center operated by Bitfarms, one of the emerging players of the cryptocurrency "mining" boom. Unlike the dollar or the euro, cryptocurrencies are not issued by central banks. Instead they are "mined" or created thanks to server "farms" like the one in the Montreal suburb of Saint-Hyacinthe -- which crack increasingly complex computer codes in order to unlock new batches, or blocks of virtual coins. Mining on a large scale requires massive computing power, which in turn requires a lot of electric power. That is where Quebec comes in the picture: luring miners with its plentiful, cheap electricity and below average temperatures -- akin to Iceland, where a sister cryptocurrency blitz is also underway. Coulibaly is among a wave of entrepreneurs flooding the province, in a bid to transform it into a Silicon Valley for the emerging sector. But some authorities are leery, fearing a surge of demand for electric power could trigger blackouts, for the benefit of an industry that few fully understand. In March, a number of Quebec municipalities slapped moratoriums on new cryptocurrency factories while the province's government and the Hydro-Quebec public utility have halted new projects to get a better grasp of the technology and its broader economic impact. The first to put on the brakes was the tiny municipality of Bromont, east of Montreal, where a new bitcoin operation was seeking to consume 30 of the town's 36 megawatts of total available excess power. 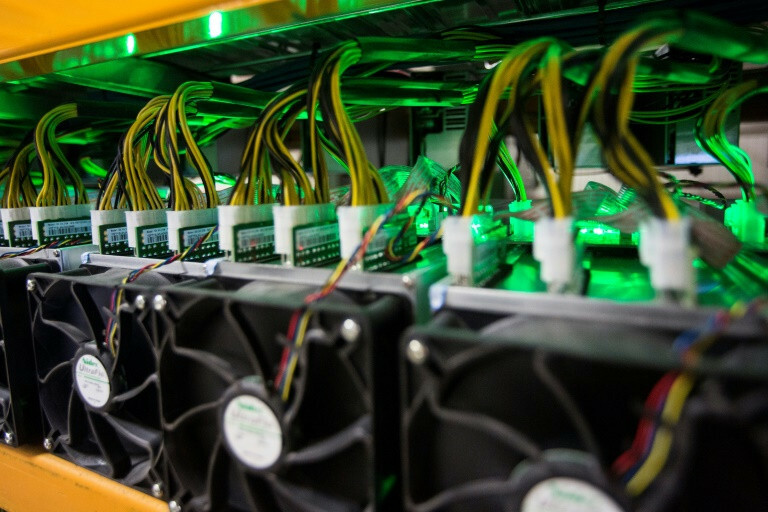 Soon after, the neighboring township of Brome-Missisquoi imposed a similar ban on new bitcoin mines. "Most of the business requests that we had in our region to open computer warehouses to mine cryptocurrencies would result in very little job creation," said the town administrator, Robert Desmarais. Marc-Antoine Pouliot, a Hydro-Quebec spokesman, added: "We can't predict the future for this industry." Authorities, he explained, "want to see first how projects can be established in Quebec in a sustainable manner," without ruling out a hike in electricity rates. According to Pouliot, the dash began in September after China moved to regulate cryptocurrency trading. Quebec has received proposals for projects that would use more than 9,000 megawatts combined, out of Hydro-Quebec's total 40,000-megawatt capacity -- equal to the power consumed by 83 percent of Quebec households. Most of the interest in relocating to the province has so far come from China, according to Pouliot. Russian investors have also shown interest, say organizers of the first international blockchain summit to be held in Montreal in April. In Quebec, "electricity is affordable, abundant and green," Pouliot said, noting massive hydroelectric dams in the north generate most of the power. The cool weather also means factories require less air conditioning. Add those factors to bitcoin's soaring valuation -- which peaked at $20,000 in December, before falling to less than half that -- and Canada has itself a modern-day gold mine, even as some critics warn the virtual currency boom could amount to a bubble, or even a Ponzi scheme. Bitfarms president Pierre-Luc Quimper said his startup already employs 90 people. "It's like a traditional mining company that digs up gold and sells it, but 2.0," he said of his company, which channels computing power to mine bitcoins and other cryptocurrencies. The internet entrepreneur made his fortune starting a web hosting and cloud services business at age 14. Now in his 40s, he says blockchain -- the name given to the shared public database where all bitcoin transactions are recorded -- is "a new technology that can be compared to the internet" in terms of "revolutionary" potential. Quimper started Bitfarms last year after first mining bitcoin at home and is confident in his investment. "I did not miss the boat for the internet; I do not want to miss the boat for blockchain," said the entrepreneur, who is convinced the technology will have applications for other industries including banking, aviation and transport. Today, the Quebec company claims to be the North American leader in cryptocurrencies and blockchain technology, and is listed on the New York and Tel Aviv stock exchanges. In its first two months of operation in November and December, Bitfarms earned $4.9 million selling virtual currency coined at the Saint-Hyacinthe and three other mines in Quebec. The company already uses 27.5 megawatts to power 19,000 computers, and is aiming to boost its usage to 100 megawatts by the end of this year. "If electricity prices spike, however, we will look elsewhere," said Quimper, pointing to the abundant power sources also available in the Canadian provinces of Newfoundland and Manitoba. 0 Response to "Quebec wary of bitcoin gold rush"